Work on overall stamina, strength, and flexibility while gaining focus and peace of mind for all ages in flow-style yoga that sequences posture change. This concludes with a short, guided relaxation. All levels welcome. 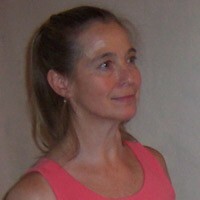 Marguerite is a workshop presenter and speaker on herbs, gardening and harvesting foods, yoga, the art of breathing, living in harmony, and sustainable living. She is a practitioner and educator on the art of walking lightly on the earth. She is the owner of Artha Sustainable Living Center, LLC with her husband, Bob Ramlow.